The Department of Adult and Pediatric Orthopedics offers the full range of modern diagnostics and treatment of diseases, deformities of the musculoskeletal system in patients of all age groups. The priority task of all specialists of the department is to preserve the mobility of the patient and improve the quality of his life. In the field of surgical treatment, the main focus is on joint arthroplasty, resection of musculoskeletal tumors, as well as surgical correction of spinal defects and pathologies. In addition, the department specializes in the treatment of sports injuries. The Chief Physician of the department is Prof. Dr. med. Nikolaus Wülker. Should endoprosthetics be required, the patient will receive comprehensive consultations, during which he will be provided with information about the types of endoprostheses, the course of surgery and the postoperative period. The doctors maximally use in their clinical practice sparing surgical techniques and modern endoprostheses from the leading world manufacturers, which allows for providing the best treatment results. Also, the doctors of the department have long experience and unique expertise in the treatment of spinal diseases in adults and children. The surgical spectrum of the department covers all modern interventions, ranging from minor operations on the intervertebral discs to extensive interventions to stabilize the vertebral bodies. The physicians of the department specialize in the correction of severe forms of spinal deformities in children and adolescents. An integral part of the department’s specialists work is the therapy of benign and malignant neoplasms of the musculoskeletal system.To this end, the doctors have at their disposal all the classic and innovative treatments. Preference is given to an interdisciplinary approach, so each clinical case is considered by a board of specialists from the related fields, for example, oncologists, radiologists, therapists, etc. 1976 - 1982 Study of Medicine in Freiburg, England, Ireland and the USA. 1982 - 1983 Department of Orthopedics, University Hospital Kiel. 1983 - 1984 General Surgery, University of California, San Francisco, USA. 1984 Board Certification, California, USA. 1984 - 1985 Orthopedic Surgery, University of California, San Francisco, USA. 1985 - 1988 Department of Traumatology, Hannover Medical School. 1988 - 2002 Department of Orthopedics, Hannover Medical School. 1990 Doctoral dissertation defense, grade: very good. 1991 Specialization in Orthopedics, Medical Association of Lower Saxony. 1993 Habilitation. Subject: "Measurement of pressure in the shoulder bursa and its movement on the kinematic shoulder model". 1997 Extraordinary Professor, Hannover Medical School. 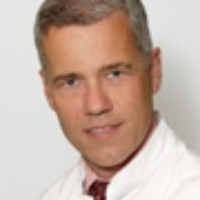 Since 2002, Head of the Department of Adult and Pediatric Orthopedics at the University Hospital Tuebingen.